Fall is an ideal time to visit New Orleans. The Big Easy's weather has cooled down from unbearable summer highs, the humidity has dropped into a tolerable zone, skies are blue, and many fragrant flowers are in bloom. It's time for celebrations, festivals, sports events, and, of course, Halloween. The later in the fall you visit, the nicer the weather will be. While the weather from late September until late December, fall by the calendar, generally makes it an ideal time to visit New Orleans, there is one rather big fly in the ointment: For all but the last three weeks of fall, it is hurricane season. Hurricane season lasts from June 1 to Nov. 30 in the Atlantic Basin, and a hurricane or tropical storm can hit the Gulf Coast at any time during that period. The most likely time for a hit is from mid-August to late October. If you plan on going to New Orleans during the fall, you should be ready to cancel in case your trip coincides with a powerful storm bearing down on the western Gulf Coast. New Orleans is at very high risk of flooding during tropical storms and hurricanes, and it is the last place you want to be on vacation if that's expected to happen. Keep an eye on the forecast; you generally get many days of warning ahead of a hurricane. If you're in New Orleans when a hurricane is forecast, the safest thing to do is leave. If you plan to do so, do it as soon as possible since planes might be booked and roads might be crowded with people leaving the area if you wait too long to make your move. If no hurricane is churning out in the Gulf, you couldn't ask for much better weather than what you are likely to find in New Orleans throughout the fall. It starts out with average highs in September of 86 F and lows of 73 F, and it still feels like summer but slightly less uncomfortable. October highs fall to an average of 80 F, with nighttime lows a pleasant 59 F. You get a big cool-down in November, with daily highs averaging a pleasant 70 F and nighttime temps dropping to 55 F. December sees daytime highs only reaching 64 F, with nighttime lows at 48 F.
It rains more in September and December than in October and November, which are the two prime fall months to visit because of less rain and the best temperature ranges. Because the temperature makes a pretty good dive from September to the end of December, what you should pack varies somewhat depending on just when you plan to visit. The one constant is a collapsible umbrella, which you should have handy no matter which month you visit. In September you should focus on summer clothes: short-sleeved shirts and tees, shorts and capri pants, sandals and lightweight canvas shoes. It stays warm at night so you won't need any kind of wrap unless you tend to get cold in air-conditioned places. If that's the case, take along a lightweight sweater or pashmina to stay comfortable inside. For October, your packing list should be relatively the same as September. But you'll need jeans or other long pants by the time the sun begins to sink, along with a lightweight jacket like denim, a sweater, and a long-sleeved top or two. Sandals and canvas shoes still are great for daytime, but you'll likely need some closed shoes for evenings at music clubs or restaurants. November marks a big change from summer. You can ditch the shorts and other summer duds for jeans, cotton sweaters, long-sleeved shirts, and a lightweight jacket or blazer to layer as needed. Ankle boots and other closed shoes will be the most comfortable in this month. December is mild in New Orleans, all things considered, but you'll need to add a leather jacket, trenchcoat, or similar to the November packing list to stay warm, especially at night. Voodoo Music + Arts Experience: A multi-day festival held in City Park where you can see a huge lineup of big-name musicians on Halloween weekend, Oct. 26 to 28, 2018. Crescent City Blues & BBQ Festival: It happens from Oct. 12 to 14, 2018, in Lafayette Square Park, where you can hear blues music on two stages all weekend and treat yourself to some mouthwatering barbecue courtesy of 12 of the best barbecue vendors in the New Orleans area. Carnaval Latino: Celebrate Hispanic heritage with music, food, and a parade Oct. 13 to 15, 2018. Louisiana Seafood Festival: Dozens of seafood vendors gather in Woldenberg Riverfront Riverfront Park Oct. 26 to 28, 2018, in a delicious event that features top seafood chefs from across Louisiana. And yes, this being New Orleans, there's music, too. New Orleans Film Festival: Check out new movies you might otherwise miss at this long-running film festival from Oct. 17 to 25, 2018. The most important thing to remember about fall in New Orleans is the threat of hurricanes. If you can forget about that for your visit, you are pretty much good to go. Be safe: If you are like every other visitor to the Big Easy, you will spend a lot of time (and even stay in) the French Quarter. It's wise to keep good track of your wallet and handbag while you are cruising down Bourbon Street or dancing to the music in a bar or club. Don't go out alone at night; take a cab if you aren't in a group or don't feel safe for any reason. Venture out: Expand your horizons a bit from the central French Quarter to find lots of great music on Frenchmen Street and interesting shops, galleries, and places to eat on Magazine Street. 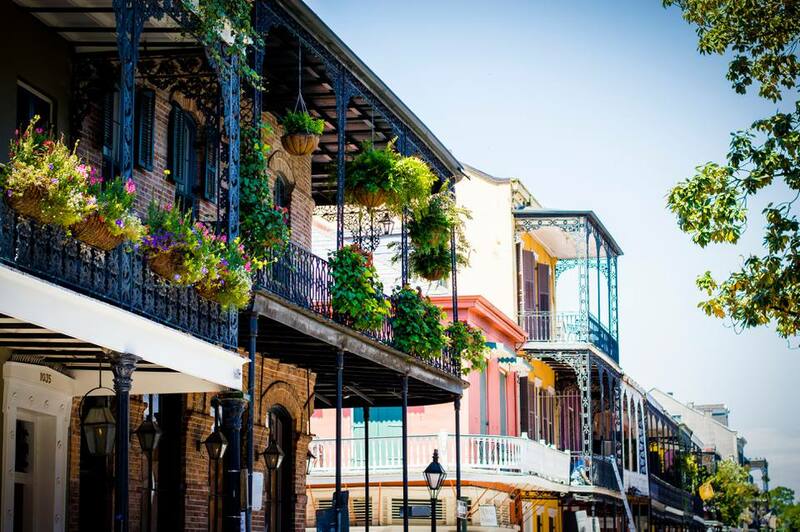 Book up: Even though it's fall, you need to book your hotel room as far in advance as possible since New Orleans is a year-round draw, especially on the weekends, when visitors from around the region come for all the city has to offer.